...are required to see Reykjavik! Time of year is crucial in Iceland. Northern Lights? Go in Autumn. Outdoor activities? Go in Summer. Both only possible in Autumn if lucky! 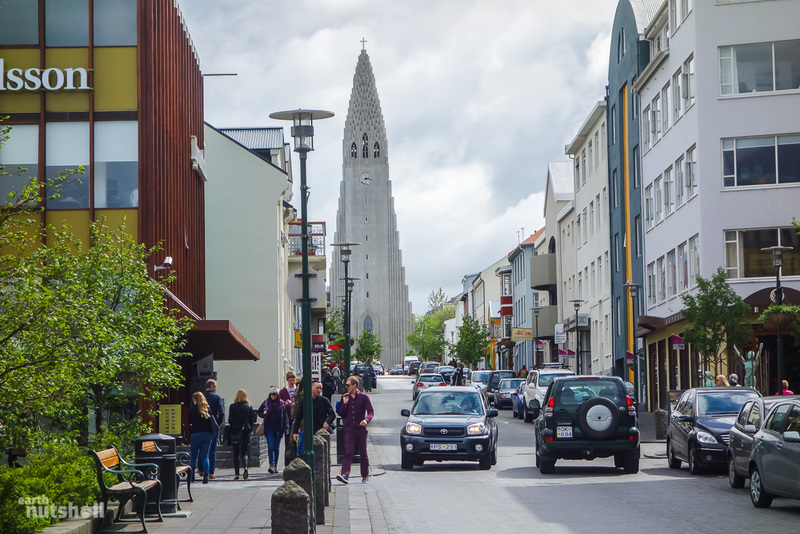 Reykjavik is very small – most people visit Reykjavik to explore Iceland further. Even with a limited time frame, I tend to agree this is the best approach. My recommendations are with this in mind. Summer (Mid-June/July/August): High season. Heaps of tourists. Almost 24 hours daylight. Everything is open, days are long, trips are easy to organise and you can fit a lot in. Weather is very comfortable. You cannot see the Northern Lights. Autumn (Sept/Oct) – Less tourists than summer. Weather isn’t as good, albeit manageable. Camping may be uncomfortable. Days are long enough to day-trip and these months are best to see the Northern Lights – Tour operators run excursions regularly. Winter (Nov/Dec/Jan/Feb/March): Especially during Nov-Feb, these are the darkest months and weather is generally terrible. Nothing open. Roads closed. You can see the Northern Lights if weather permits, even as late as March into April (spring). Spring (April/May/Mid-June) – Still covered in snow from Winter – a beautiful time for photography seeing the land come back to life. Some closures remain, however nearing end of May this changes in anticipation for the Summer tourist flock. Reykjavik should be used as a base, giving you a healthy combination of relaxed, Nordic city culture (with surprising night life) and beautiful natural phenomena during day-trips from the city. Keflavik Airport, where you’ll land; is 50km from Reykjavik, where you’ll be staying. Shuttle buses run around flight timetables. Catch one. Otherwise taxi’s are not cheap. Keep in mind: Reykjavik is expensive, yet comparatively cheaper than outside the capital. Accommodation especially is limited and expensive outside Reykjavik. Worth considering if you are contemplating the seven day Ring Road loop. 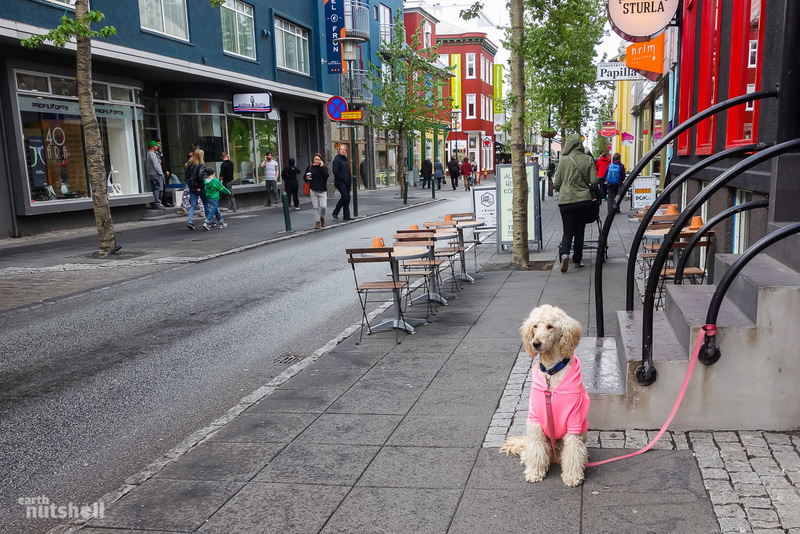 Everything within Reykjavik itself is within walking distance. To leave Reykjavik without being on a tour, public transport is limited to local bus or taxi. The puffin. 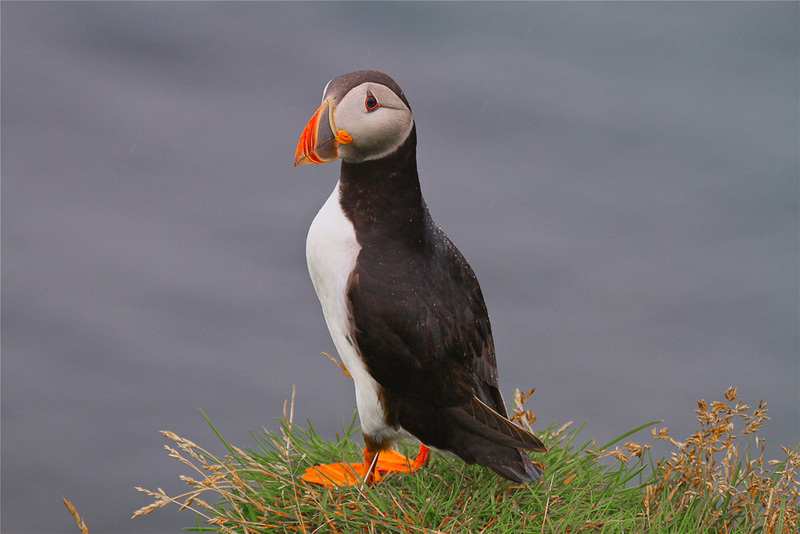 A national icon of Iceland, home to the largest single colony of Atlantic puffins in the world. 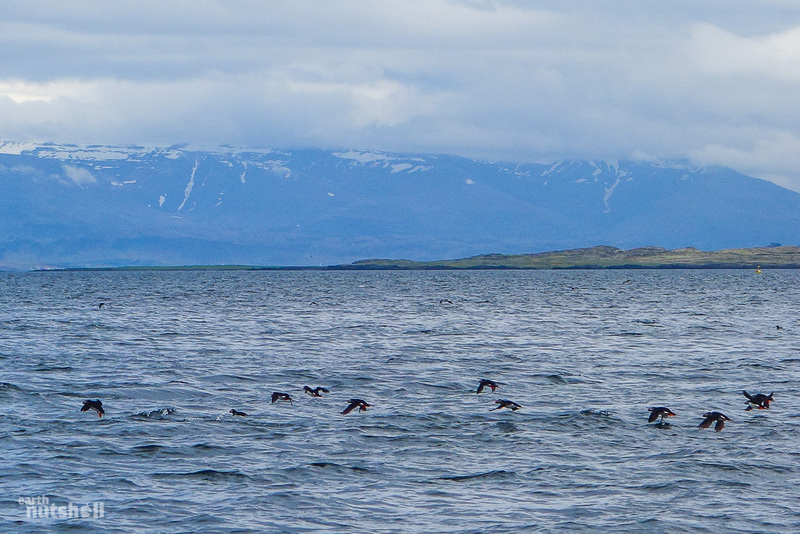 Conveniently, you can see them in their natural habitat just offshore from Reykjavik. Head down to the harbour and book onto the Puffin Express to Lundey island. It lasts for an hour, and between May and August you are guaranteed to see these unique, colourful birds. Price is ~5000 ISK (37 USD). Bring along warm clothing, camera and your patience – these birds never stop moving! 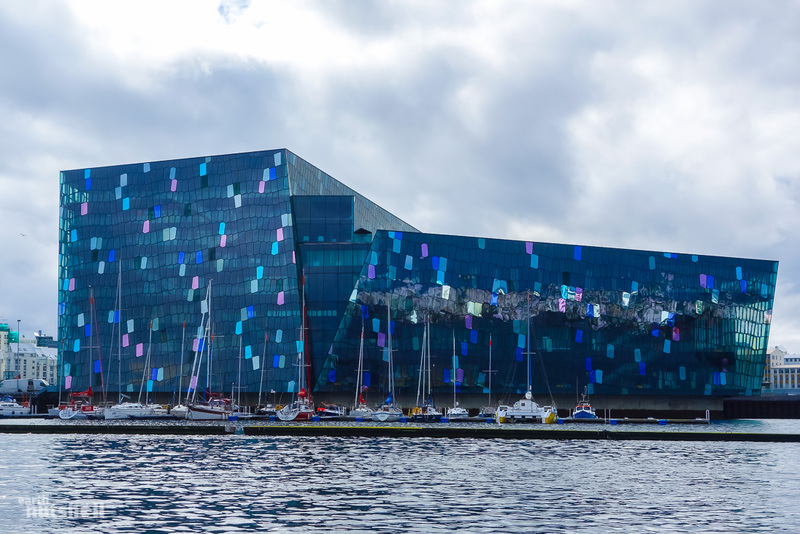 Impossible to miss due to its eye-catching design and reflective coloured walls, Harpa; Reykjavik’s Concert Hall and Conference Centre is set down by the harbour. 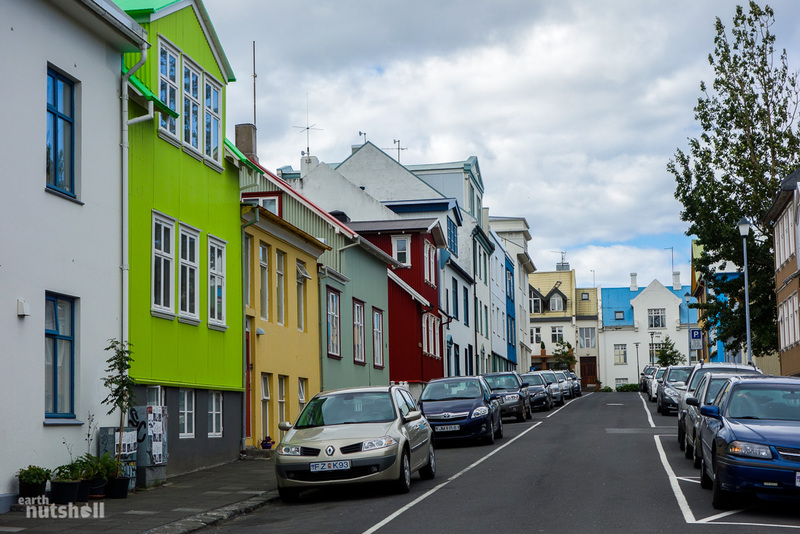 On a stroll down by the waterfront, definitely allow a stop to explore inside where the architectural detail is stunning and wide views of Reykjavik are available to satisfy your camera. For those more interested, 45 minute guided tours run regularly where you visit all three performance areas. 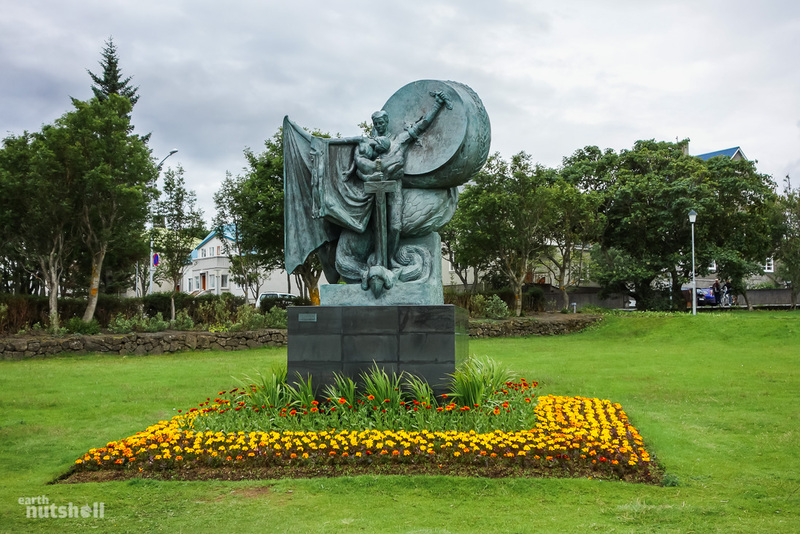 If you are lucky enough, there might even be a performance on during your stay in Reykjavik – follow this link to find out. Inside also features a gift shop, a cafe that offers Wifi and many seating areas to relax — maybe an excuse for a wine? It’s open 08:00 until 24:00 every day. 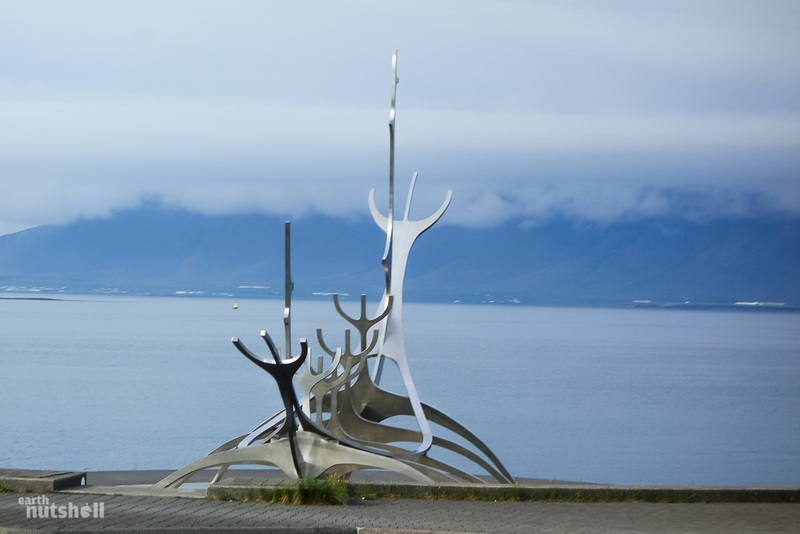 An iconic Reykjavik sculpture commemorating the 200 year anniversary of the city, and it isn’t actually of a Viking ship! From the horses mouth, it’s a dreamboat that symbolises light and hope. It’s located in the centre of Reykjavik, you’ll come across it on a casual scenic stroll along the sea line down from Harpa. Worth visiting just as an excuse to enjoy the Icelandic air, or for an obligatory Reykjavik selfie with volcanic mountain range backdrop. Iceland is expensive. Especially in comparison to neighbouring countries, so you’ll want to avoid the international chains in malls. This is mighty convenient, because these two streets offer interesting, unique and independent stores you haven’t heard of before — the kind where you could have a chat with the owner. They are great to explore. Laugavengur has a wide range — it’s essentially the ‘high street’, from exclusive fashion down to boutique goods, dollar stores and everything in between accompanied by all kinds of eateries (the bakeries are lovely!). Skólavörðustígur however, runs up to that big church and between colourful Nordic housing. The street offers stunning art galleries, book stores, local craft stores (Icelandic wool, anyone? ), thrift shops with peculiar styles and some souvenir shops that will impress. Imported souvenir junk? It’s minimal. Instead, jewellery made from volcanic rock, sculptures, woollen goods and puffin-related everything. You won’t miss these streets, and you shouldn’t – you can easily sink hours here. Otherwise known as ‘that really cool looking church’, always visible towering into the Reykjavik skyline, this is also the cities observation deck. 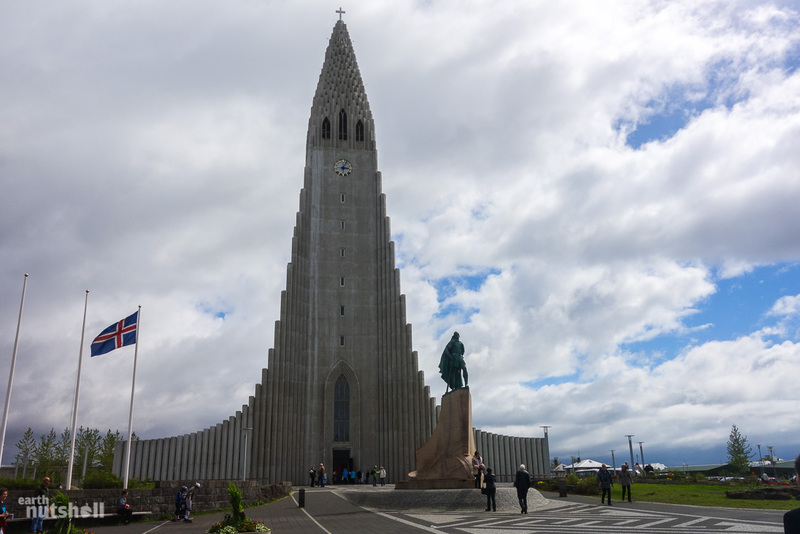 It’s the largest church in Iceland and designed to look similar to lava flows. Quite fitting. You can enter for free, or take the lift to the top for a modest fee, 800 Króna ($6 USD) – certainly worth it for the beautiful panoramic views. Inside is dissimilar to many European churches, instead opting for a simple yet elegant design — it also houses a huge pipe organ. With any luck, an organist may be present to show you what it’s capable of. Take a stroll around Tjörnin Lake and adjacent Hljómskálagarðurthe park presenting great views of this part of town — there’s no shortage of colourful Icelandic homes to admire. Feed the ducks, geese and swans (among 40-50 other species that frequent here) and visit the multitude of statues lining the park. The Reykjavik City Hall can be seen from the lake, and the National Art Gallery is next to the church if that takes your fancy. Alternatively, or additionally you could divert to the east to Laugardalur Park. Popular with locals, it has an ice skating rink, Icelandic domestic animal petting zoo (horses! 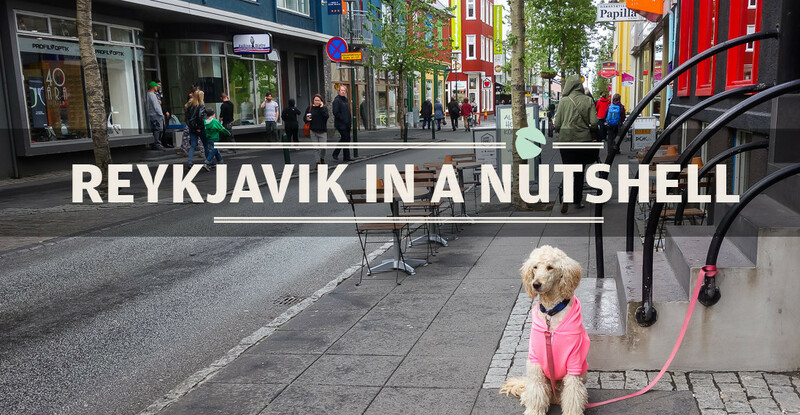 ), swimming pool and a cafe – a perfect choice if you are travelling with kids or if the weather has forced a lazy day in Reykjavik! An obligatory visit, one best enjoyed at the start of your trip rather than later. You’ll walk away with a great overview of relatable Icelandic history for the rest of your stay, even if you aren’t a history buff. It’s laid out over two floors, chronologically from Iceland’s settlement history to modern times, showcasing authentic artefacts that are contextualised well with text and graphics. Everything’s in English along with Icelandic, and exhibits change often – some of it is interactive so the kids will be happy (for at least part of it!). It’s just down from the park and you can easily spend 2-3 hours here if interested. Regardless, if one museum is about your limit — this should be your one. There’s a gift shop and cafe here that offers Wifi, too! Inside Perlan. Lavish fine dining – and the price didn’t disagree! 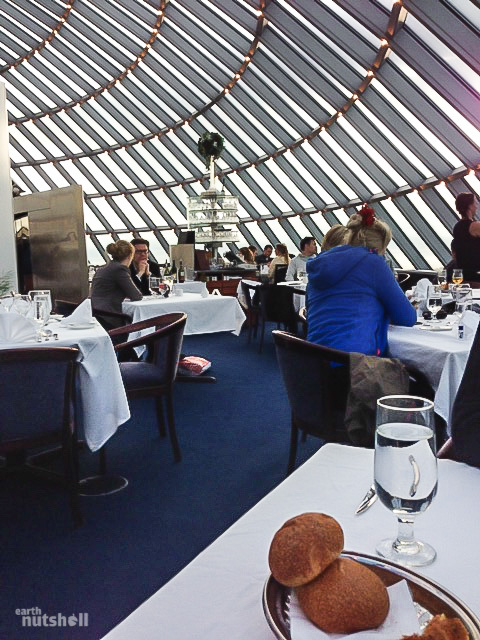 I don’t like to corner people into specific restaurants, but Perlan is a landmark worth experiencing – a unique revolving restaurant sitting atop a hill with lovely views of Reykjavik. You might have seen it, that shiny dome building more akin to a telescope than a restaurant – elevated by 6 enormous water tanks. It’s fine dining, and expensive, expect your hat to be taken at the door kind of service, but for those wanting a picturesque dining experience with an extensive budget — this is it. Get the lamb in two ways. It’s fantastic. Iceland is known for it’s lamb, locals and tourists a like will tell you Perlan does it best. Adventurous? Maybe try some whale. They offer set menus, and a variety that can be ordered a la carte. Oh and don’t forget to check out the Strokkur geyser replica outside, either. No trip to Reykjavik is complete without a day trip to witness Iceland’s unique landscapes, beauty and natural phenomena. It can be done relatively cheaply in what is labelled as ‘The Golden Circle’ — the countries most popular tourist route. 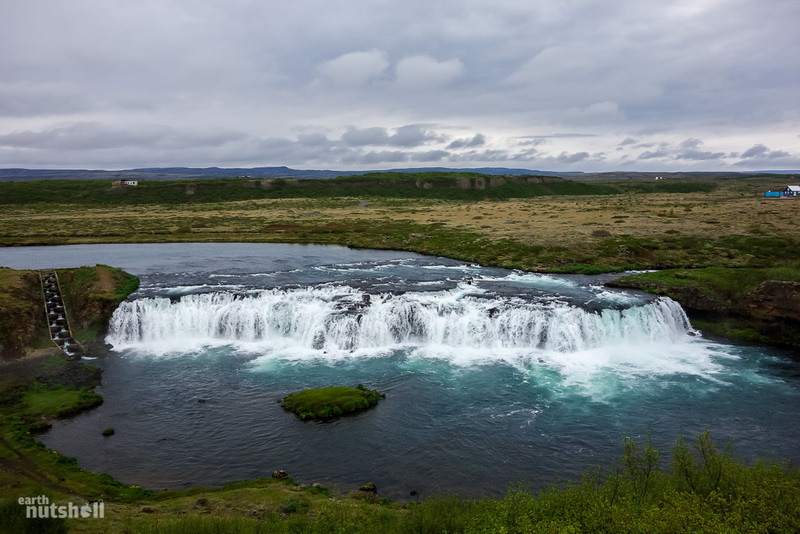 It’s a 300km loop round-trip into central Iceland from Reykjavik, and encompasses many great sights, from waterfalls to active geysers, ancient volcanoes and rich history. It’s a great overview of the real Iceland, you can’t miss it. It’s a long day though – approximately 9 hours. 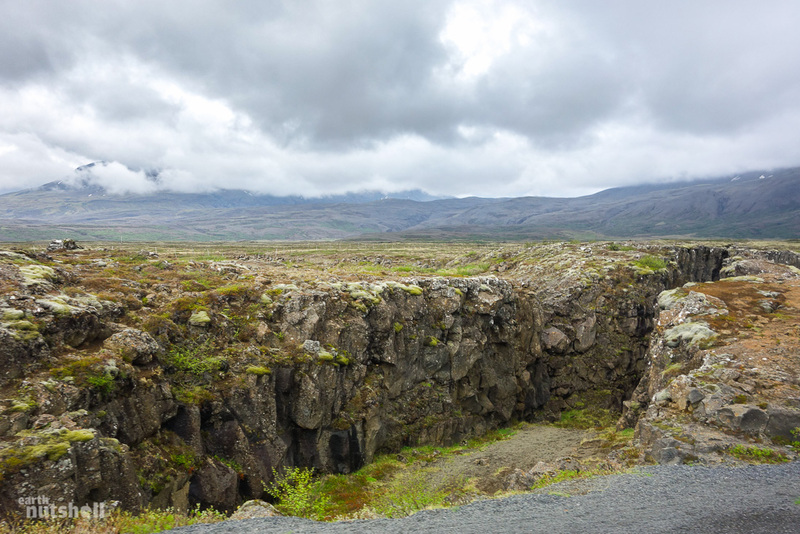 You’ll likely enjoy it more at your own pace with a rental car however the vast majority join a coach tour, which are easily booked online before arrival or from every accommodation option in Reykjavik, even the day before. It’s that popular. A tour will set you back ~9300 ISK (70 USD), depending on the tour operator. Listed below are some of the stops you’ll make! Another of Iceland’s most famous attractions – the originator of the English term ‘geyser’ and it’s still (very active) brother — Strokkur. These are fountain geysers located in the Haukadalur geothermal region. 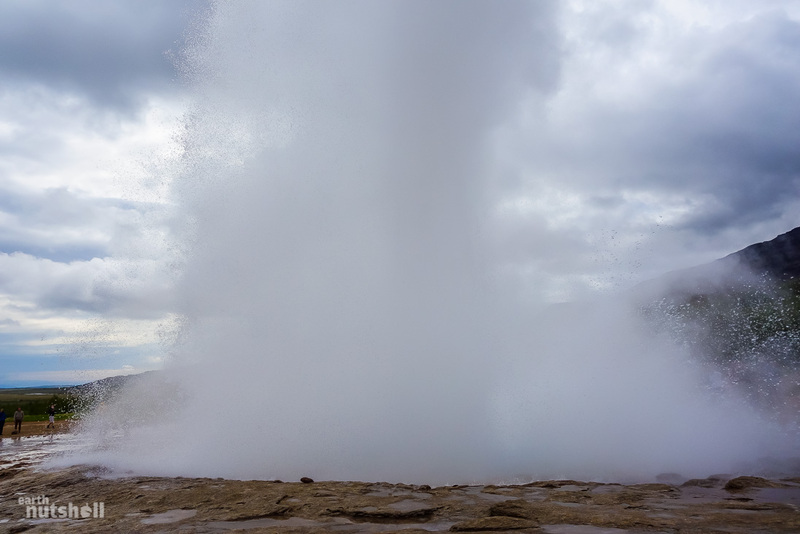 The Great Geysir has not erupted since 1916, however it bubbles (and smells just as bad) just 50 metres down from Strokkur, which still erupts every 3-8 minutes. For your viewing pleasure, it can reach up to 20 metres high with 80-90 degree Celsius temperatures, so don’t get yourself and your camera too close in anticipation or you’ll receive more than you bargain for. 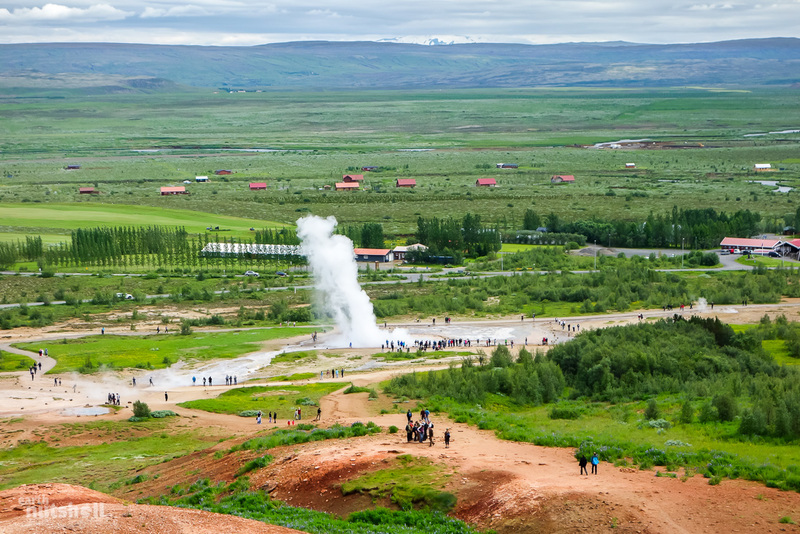 The surrounding area is filled with steam vents, mud pools and smaller attractions such as the cute Litli Geysir. 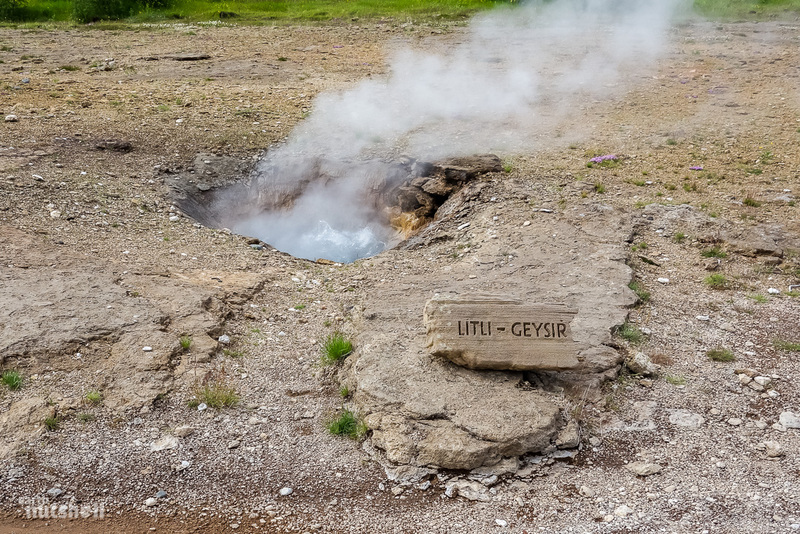 Across the street is the Geysir Visitors Centre for further information about the volatile activity just under your feet — probably best left till the end! Naturally stunning, and a world heritage site of historical importance, this national park houses Alþingi (Althing) – Iceland’s ancient parliament formed in 930 AD which makes it the earth’s oldest functioning parliament. Sitting within a rift valley, you can also see the physical result of American & European tectonic plates shifting apart, and if you are very keen — with some extra organisation from Reykjavik you can organise a guide and specialised dry suits to snorkel or scuba dive between an area (Sifra) of these plates in crystal clear, glacial water. It’s not every day you can claim you drifted between continents! 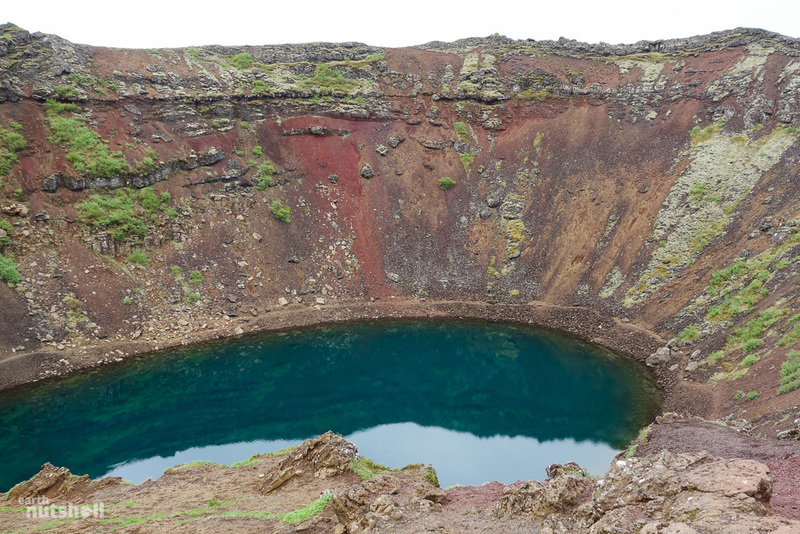 A volcanic crater lake within a caldera of magnificent scale, approximately 270 metres across. It’s the most in-tact caldera within the Western Volcanic Zone of Iceland, in the winter until April it is regularly frozen over, but otherwise produces a year round bright aquamarine colour due to the soil contents. 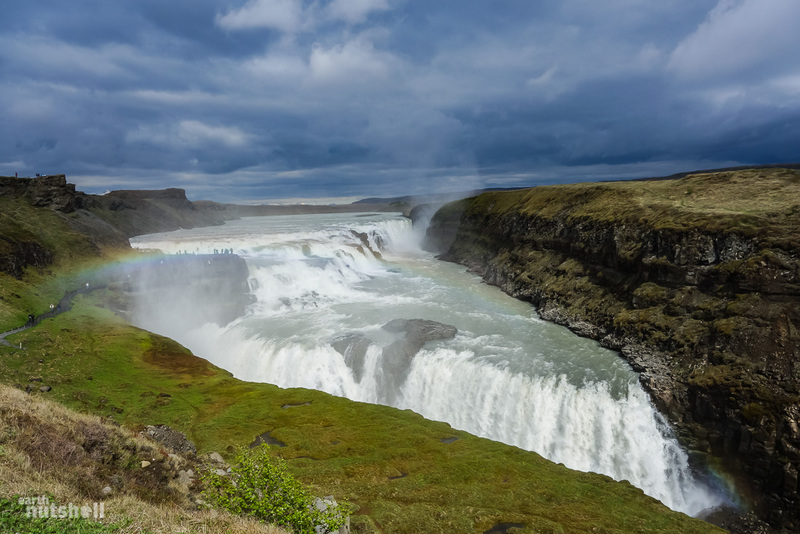 Located about 12km from The Great Geysir, this is another waterfall worth checking out in a loop on the Golden Circle. Utterly dwarfed compared to Gulfoss, however a picnic area and beautiful surroundings make it a worthy stop-off. It’s popular with white water rafters and even kayaks, so who knows what you’ll see on your way through. These are traditionally left out of most organised tours into the Golden Circle, however if you are self-driving they are conveniently close to your route. Hellisheiði Geothermal Power Plant – Third largest in the world, and home of the Geothermal Energy Exhibition encompassing educational tours and presentations. Hveragerði – Greenhouse village run on volcanic hot springs. There is a geothermal park here. 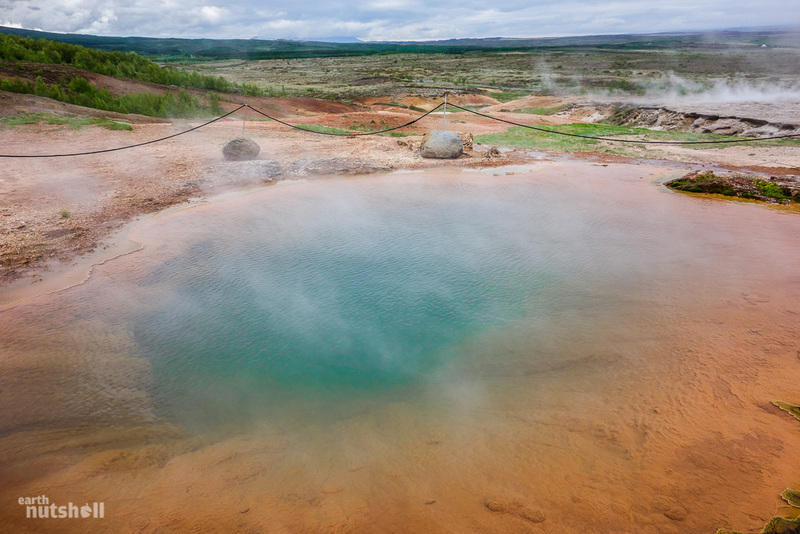 Laugarvatn – Fontana Geothermal Baths is here, some say it’s better than The Blue Lagoon. A more personalised experience with less crowd, fluctuating pool temperatures and a real natural hot spring not for the faint of heart. Skálholt Cathedral – A historic and holy place for Icelanders. Skálholt is the ancient home of Iceland’s most important people, it’s only 25km from The Great Geysir. 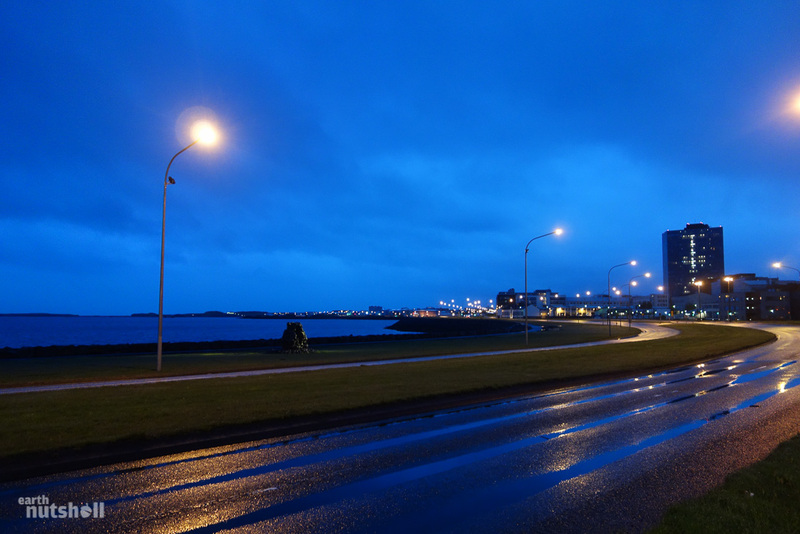 Reykjavik at 1am, at it’s darkest. Total sunlight again by 3am. Use the long days, enjoy nights out! You’ve spent the day on the road, now you’re finally back to Reykjavik. Hungry? Revisit Laugavegur Street for dinner. By evening, this street explodes in unexpected night life — seriously. Restaurants, bars and clubs, you’ll find almost every tourist here chattering away about how beautiful this country is, especially in the 24 hour summer daylight. Try a local delicacy for dinner, perhaps some puffin? Perhaps some whale? How about a horse steak? Enjoy some local beers, Viking Lager perhaps? Egils Gull? Oh and if it’s your cup of tea — continue your night into one of the endless nightclubs here. Most are small, more intimate and personal ventures unlike that of most in Europe and you’ll enjoy your time. Nightclubs are open until late, and by that, I mean early – it’s very common to see people lining to enter at 7:30am in absolute sunlight as locals are heading to work. The hot dog stand close-by does a roaring trade! You’re in Iceland. You’ll want to see some Ice. Unfortunately, you can’t within the vicinity of Reykjavik during summer. 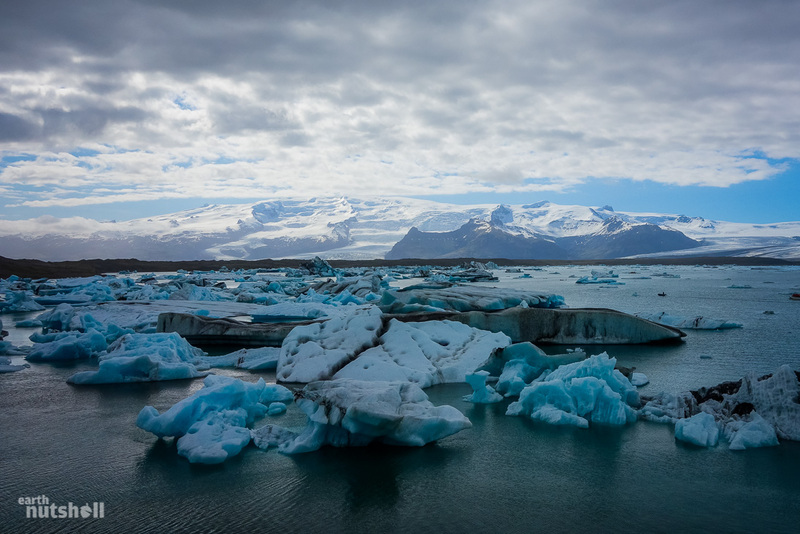 Vatnajökull however is 4 hours away and is Europe’s largest ice cap outside the Arctic, offering reachable glaciers and icebergs — need I say more? 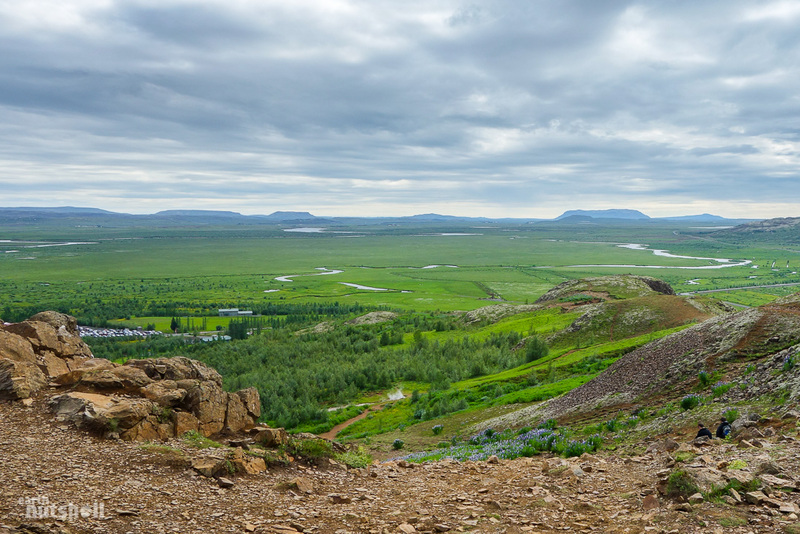 Take a tour here from Reykjavik, they run every day during summer and range from hiking adventures and ice climbing to traversing glaciers via snowmobile. Just hiking is absolutely worth it and you’ll save some money. It’s a long way, one hell of a day trip, but it’ll satisfy your lust and put a checkmark beside most of your Iceland boxes. Remember you have almost 24 hour days to work with during summer, make use of it! 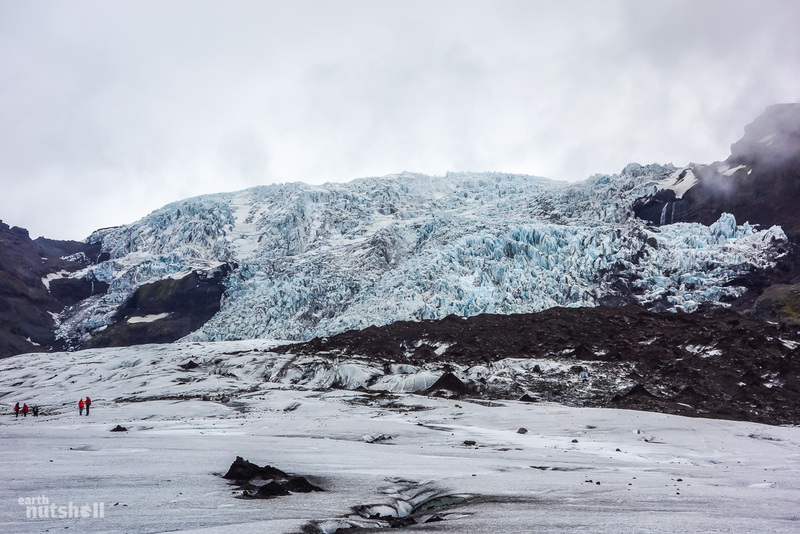 An accessible, hikeable tongue of the massive Vatnajökull glacier. As far as glaciers go, it’s family friendly — allowing people of most ages and fitness to experience an up close and personal walk atop ice formations, around endless, dark crevasses and between spectacular ice falls of a scale we can’t quite comprehend. You need a guide and you definitely need the right gear including crampons (metal spikes) for your shoes which are available at the Vatnajökull visitors centre. The photos speak for themselves, yet still don’t come close to doing the beauty justice. One of the most breathtaking sights I’ve ever witnessed. 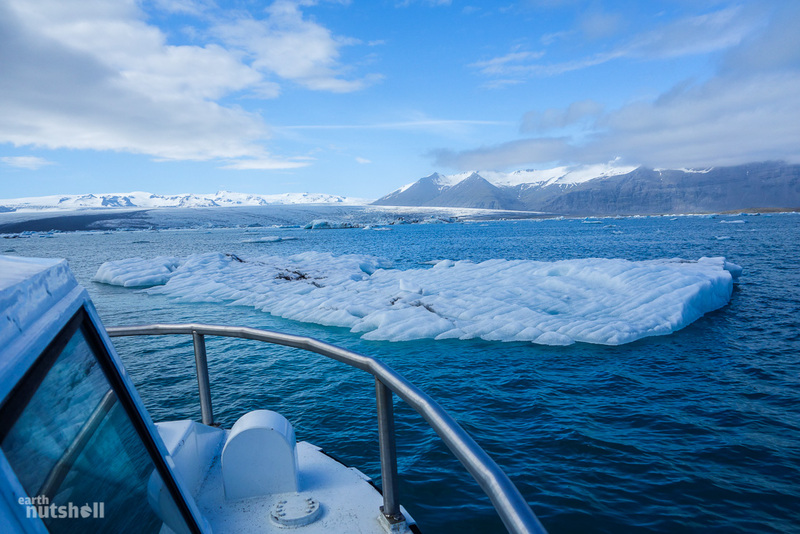 If on a tour or booked in advance, you even get to launch out onto the icy lagoon in an amphibious land/water vehicle. If your lucky like I was, keep your eyes pealed for seals lounging near the surface or on icebergs. Calm, relaxing and picturesque is an understatement. Just amazing stuff. On the outskirts of Reykjavik, lush green farms set between the mountains are plentiful. 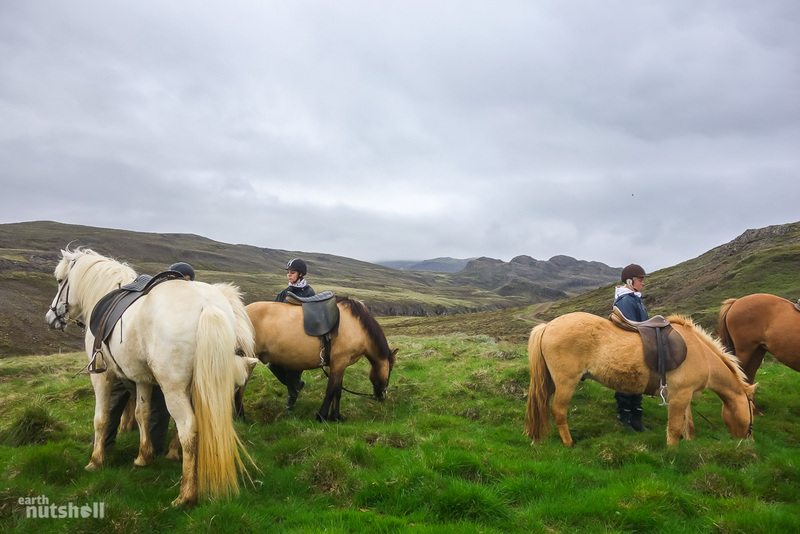 Many of their owners offer affordable experiences to visitors who’d like to join their families and head out atop an authentic Icelandic Viking horse into the undulating alien lands of Southern Iceland. The open air here is just exhilarating. Sounds cool, because it is! I had never ridden a horse before, but thought…what better place to give it a shot? The horses were friendly, docile and easy for beginners (luckily). I walked away with a stunning, unexpected perspective of Iceland, a new experience; and some sore groin muscles. Totally worth it. Waterproof clothing, helmet and city pick up is supplied by the owners, ask your accommodation if they can organise it for you! A soothing way to end your long days in Reykjavik! 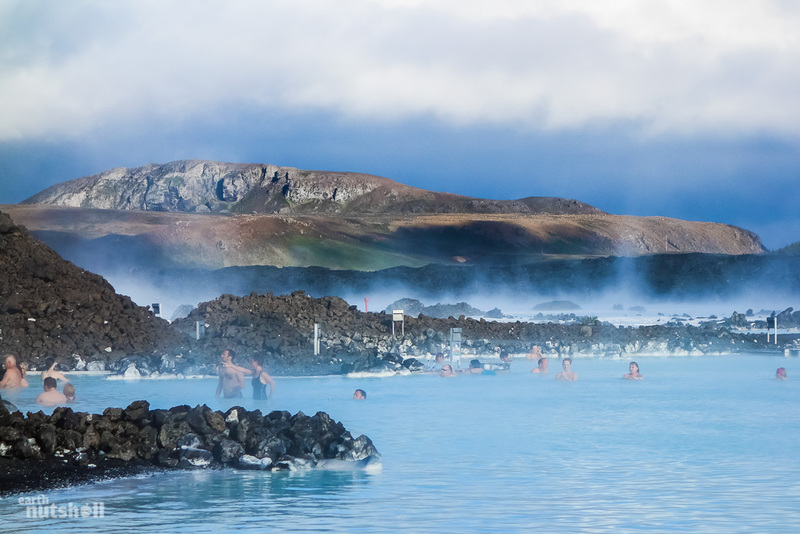 Blue Lagoon is a geothermal spa located in a lava field, surrounded by volcanic rock and overlooked by majestic mountain ranges. Water temperatures sit at ~39 degrees Celsius, quite the contrast to the Icelandic air, even in summer — ensuring a misty aura sits above the lagoon at all times. Find your own little area, disappear into the steam and relax on your last day here, it’s great for your skin too. In-water massages and treatments are even available…so any men reading this, your significant other will thank you. Oh, and while you wait there is conveniently a bar inside the lagoon itself. Perfect. Blue Lagoon is closer to Keflavik airport than it is to Reykjavik. Keep this in mind, plan accordingly (possibly get an afternoon, or evening flight?) to get the most out of your time — that’s why I left it until last! P.S – Have any questions? Been to Reykjavik yourself? Think I missed something? Comment below! I’d love to hear from you. Interested in Iceland? More coming soon! Follow me on Facebook! Next Article Macau: Asia’s answer to Las Vegas? I visited Iceland back in 2010! I thoroughly enjoyed reading your blog. On my school trip, I remember visiting Reykjavik, the Blue Lagoon, The Golden Circle and Jokulasarlon Lake (where I took a photo of the lake and won a school competition – this really got me interested in travel/photography) 🙂 Thanks for sharing. Brings back the memories!